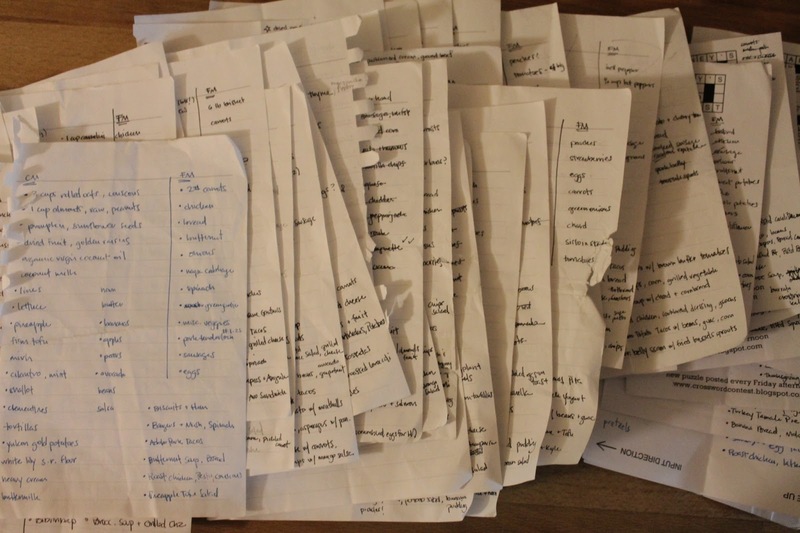 Starting in the first week of 2012, I saved every scrap of paper I used to record my weekly menu plan. At the time, I didn’t really know why I was saving them. As each week passed, I’d just take the old list off the fridge and add it to the pile on the bookshelf. Now it’s 2013 and I’m looking through my lists for the first time and, for me, it’s fascinating. These lists are records of how I spent much of my free time this year. They show Henry’s first snacks and meals, the dishes I cooked for my loved ones’ birthdays, our weekly Downton Abbey suppers last winter, Henry’s first birthday party, the time Helen asked me to try to recreate a Wendy’s spicy chicken sandwich with local/from scratch ingredients, and the meals I cooked to comfort my family after our beloved dog, Snuggles, died this fall. They also show, quite plainly, how much my cooking-style has evolved over the course of the year. When I flipped back to the first menu (the one in blue ink on the left side of the picture above), I was shocked to see that 4 out of 6 meals contained meat, and each used a different kind of meat too. For the past several months, I’ve limited myself to only one, maybe two, meat purchases a week, and these are usually spread across at least two different meals. A whole chicken is great for this, because I can roast the chicken for one dinner, pull all the remaining meat off the bones for a second dinner, and turn the carcass into stock for a third dinner. A pound of ground breakfast sausage is a runner-up favorite, because I can use a little for breakfast tacos one night, some more (mixed with cheese, herbs, and breadcrumbs) as wee little meatballs on top of spaghetti the next, and the rest as a special weekend breakfast of sausage and biscuits. Do more canning! My sister and I canned 25 pounds of tomatoes this summer, and it has been so much fun to cook with them this winter. I want to do more of this in 2013. Expand my vegetable garden and actually use the stuff that comes out of it. I’ve got a couple lovely kale plants that have been ready to harvest for weeks now, and I keep buying kale anyway. I don’t know why. Also, we didn’t chicken-proof the garden well enough and those clever broads climbed under the fence and devoured most of my young winter crops. So, room for improvement! I love your blog, and try to catch up with you/it when I think about it. I do “this and that” and would love to incorporate some of your 2012 menus in one of my, yet to be visualized, works of art. However, I understand how random this must sound and…..
Also, I am a big fan of Joanna, Javi, Clara and Lucy…. Just throwing this in to get on your good side.